August 31, 2006. 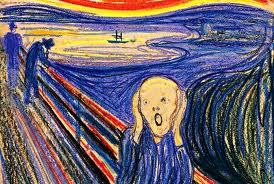 Edvard Munch’s “The Scream” recovered in a raid by Norwegian police. If I had more time I try to find out what it had been doing since stolen a little more than two years before (August 22, 2004). No. I’ve always been curious as to 1] what was Munch’s motivation for such a horrific depiction of human suffering? 2] why would someone want to have it hanging on a wall, in the place the children could see when they were tall enough. There are four “Screams” on earth. The one that sold in May 2012 went for $120 million to a secret bidder via telephone. Considered to be the most valuable of the four versions, as it is the only one with a poem written on the hand-painted frame. “I was walking along a path with two friends – the sun was setting – suddenly the sky turned blood red – I paused, feeling exhausted, and leaned on the fence – there was blood and tongues of fire above the blue-black fjord and the city. I hope Mitt Romney takes a second look at his purchase (the piece is probably hanging in the car elevator) and takes heed. Suicide Hotline, may I help you? Hello? Hello? Can you hear me? You sound like you’re in cave? Are you in a cave? The echo makes it hard for me to understand you. I am not in a cave. I’m in a chamber. I hear something crackling. Are you eating popcorn? Now I can hear it. Hissing. Crackling. I’m not going to ask you about what. I am going to ask you something. I want an honest answer. Do you have an asp? I’ll risk showing my age by saying that I had serious crushes on Humphrey Bogart, Charles Boyer and Joseph Cotton. As for movies I’ve watched over and over, Gaslight, For Whom the Bell Tolls, and Casablanca come in first. Once, I faked being sick so that I could stay home from school to watch The Inn of the Sixth Happiness, scheduled to air on the Morning Movie slot on old Channel 9 in Los Angeles. My mother returned unexpectedly from her errands. She stood in the doorway, shaking her head, then walked over and snapped off the Hoffman Easy-Vision television set. “You should know something about Ingrid Bergman,” she said. All I knew of the actress was she had a strange way of captivating any scene, and her nose looked real. Mother then told me the chilling tale of how Ingrid Bergman has cheated on her husband and chased after a wild Italian man and been banned in Hollywood. Heady stuff for my ten-year old romantic imagination. Today, August 29, is Ingrid Bergman’s birthday. It is also the day she died, in London, UK, in 1982. Martin Luther King made his “I Have A Dream” speech on the steps of the Lincoln Memorial. WorldCom executives Scott Sullivan and U.S. Buford Yates Jr. indicted on charges of criminal fraud in connection with the company’s collapse. Four years ago today Barack Obama was nominated for the Presidency of the United States. For one, brief shining moment, it looked as if America’s march into fascism and oligarchy were to be placed on hold. Or so we thought. Then, something worse happened: Obama was elected President. Ever dig a hole by the seashore or a riverbank? Remember how hard it was to keep the water from oozing up and destroying your hard work? The bile of hatred that has risen from the bottom cannot be stopped by good intentions, hope, intelligence, or truth. Bigotry has rebounded with a vengeance, fostered by a media that puts the propaganda of Joseph Goebbels to shame. I say, let the fascists and corporations and “we’ll-be-rich-if-we-vote-for-the-rich” finish what they started. In 2016, those of us who survive the onslaught from the top – oh blessed trickle-down that worked so well from 2001 through 2007 – be heeded. I doubt it. It will be hard to hear the whispers of “I told you so . . . ” over the cacophony of ignorance, the groans of a dying nation. Two days ago I wrote about a “Day of Betrayal” regarding the Marianas Trench and dubious protections. On this day, Bush follows through. “Congress also worked with me to cut income taxes for the first time in a generation — the right policy at exactly the right time to boost our sagging economy. The faster our economy grows, the stronger the federal budget will be. The greatest threat to our budget outlook is the danger that Congress will be tempted this fall to break its earlier commitments by spending too much. The old way in Washington is to believe that the more you spend, the more you care. What mattered was the size of the line in the budget, not the effect of that line on real people’s lives. My administration takes a new approach. We want to spend your hard-earned money as carefully as you do. And when we spend the people’s money, we insist on results.